Some types of jigs are also called as a templates or guides. Jigs include vowin.cn/en/News/news1251.html' target='_blank'>machining jigs, woodworking jigs (e.g. tapering jig), welders' jigs, jewellers' jigs, and many others. 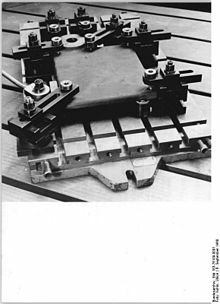 Printed circuit board (PCB) jigs are used to test PCBs. They have a dump board inside the jig which can find faults in the PCBs.